Located in the heart of the city, only 200 meters away from the well-known Ursu lake. The hotel is welcoming guests from 1st June 2013 with 88 quality rooms and 5 apartments, some of them providing a wonderful view on lake Ursu and the surrounding forest. The hotel is offering medical treatments, fitness, wellness and beauty services, recreation, gastronomic pleasures and high-quality conference services. Should the purpose of your stay be business or entertainment, the wellness and conference services of the hotel will suit your needs. Danubius Health Spa Resort Brădet**** superior is an ideal starting point for a remarkable trip to Transylvania. 88 rooms equipped with air-conditioning and 5 apartments, balcony, bath tube or shower, bathrobe, hair dryer, minibar, safe, television, wireless internet for free, phone. HEALTH, WELLNESS, FITTNESS SERVICES are available in the neighboring hotel Danubius Health Spa Resort Sovata****, in a renovated and extended health and wellness centre with various available services, including massage, sauna, pools, Danubius Premier Fitness room, individually tailored fitness programme. WELLNESS, BEAUTY SERVICES in the neighboring hotel Danubius Health Spa Resort Sovata****, including quality cosmetic, relaxation services, manicure, pedicure. The Margareta event room with air conditioning, having the capacity of 500 persons. Im Zimmer kann 2 Erwachsene übernachten. Unter mit 12 Jahre Kind(er) kann insgesamt 4 Personen im Zimmer übernachten. 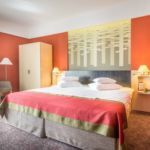 Danubius Health Spa Resort Bradet Sovata Bewertung ist 9.4 aus dem 10, nach 45 echte Gästebewertungen. "Tiszta, a központban van de a természetben, jól megközelíthető, a fürdő is minden igényt kielégítő." 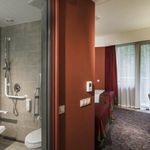 "A fost f frumos recomand un sejur la hotel Bradet f curat mâncare f bună totul a fost minunat"
Die Dienstleistungen von Danubius Health Spa Resort Bradet Sovata haben hohe, 9.4/10 Bewertungen nach echte Gästemeinungen. 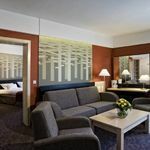 Alle Reservierungen wird direkt vom Danubius Health Spa Resort Bradet Sovata bestätigt.